The Multiple Sources informational text standard requires elementary school students to examine two or more texts on the same topic. Students don’t necessarily have to find these sources, as we do with some research standards. The focus here is on analysis. Students are expected to analyze how those sources present information. This includes an analysis of the content, presentation, and word choices. This standard is about using a critical eye to examine more than one sources of information. The language of the standard details specific points of analysis for each grade level. Third graders are looking specifically for similarities and differences between the points and details presented in each text. Ideally, your third graders would ex- amine at least two different sources, digital or print, and begin to compare them. How are they alike? How are they different? What nuances or shades of gray exist? In terms of critical thinking, this is really at the synthesis and evaluation level. Each of the standards so far have required students to think critically about informational text with an explicit focus on one aspect of critical thinking. This standard, Multiple Sources, is about integrating those skills into one task. 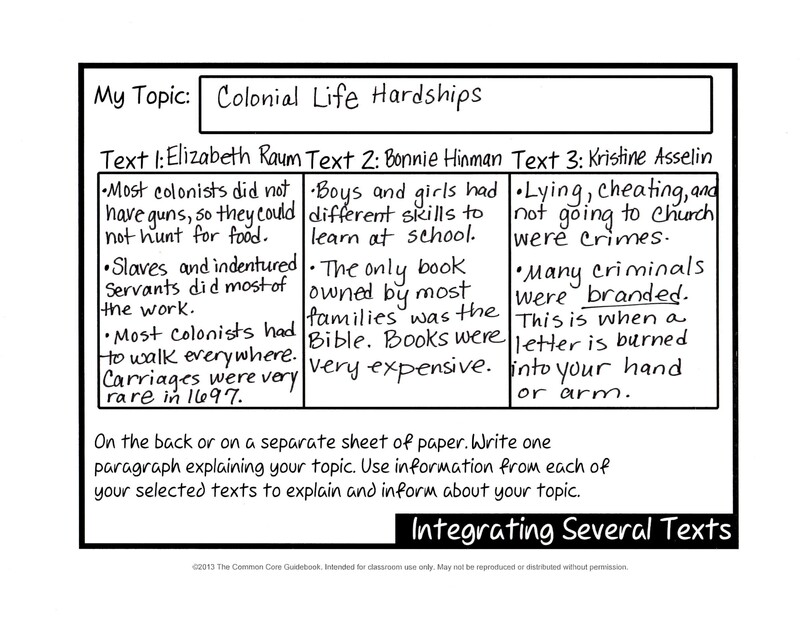 Students will consider multiple facets of a text when analyzing what they read. They will draw from each of the standards to compare and contrast multiple texts. Upper elementary students in grades fourth and fifth are also expected to consider multiple sources on the same topic. The goal here is not just to compare and contrast these texts. Fourth and fifth graders need to move a step beyond just the comparison. Students in these grade levels are expected to integrate the information from these sources to write or speak about the subject. To demonstrate mastery students in the fourth and fifth grade will need to move beyond just answering questions. They need to engage in a discussion and/or write about that topic. As a teacher, you have several goals. First, you have to teach students to look at two texts about one topic and determine what information they can extract from each text. A simple strategy for this is simply asking students to write down, in their own words, a specific number of facts from each text. Second, students need to look at that information and figure out how they can use that to talk or write about that topic. This demands some decisions about what is most important, how categories of information fit together, and how to explain this to another person. Most students will want to simply read what facts they gathered. You want students to make decisions about how to present that information to an audience. To find success here, students need to have explicit practice comparing ideas, individuals, and events as they are presented by different authors. To teach this standard you need sets of paired readings that explore the same topic or at least similar subject matter. This is also a standard where student interests should help guide the topic selection. Self-selected topics are effective and will result in higher levels of student engagement with this standard. A person, event, or cause is often a great topic to begin with. As you approach your instructional plan it will be easy to get overwhelmed. Keep in mind that this standard is multifaceted; it really defies classification as just a reading standard. Students will need to read, write, think critically, and explain to meet the goals and rigor of the Multiple Sources standard. Recently, I used three books with a fifth grade class. We read The Dreadful, Smelly Colonies by Elizabeth Raum, The Scoop on School and Work in Colonial America by Bonnie Hinman, and The Real Story about Government and Politics in Colonial America by Kristine Carlson Asselin. As a class, we completed an organizer together. The class will continue to use this same organizer with other text sets throughout the year. Click here to download a blank organizer to use with your class! Do you have some paired texts that would or have worked well for student analysis? Share your ideas here! Great ideas! I am going to give this a try in my fourth grade class!